The Police today arraigned Senator Dino Melaye before an Abuja Magistrate court sitting at Wuse Zone 2 for breaking the windscreen of police vehicle conveying him to Lokoja, and threatening to kill himself. He arrived in a stretcher. The arraignment by the police was based on a first information report, accusing him of breaking the windscreen of the police vehicle conveying him to Lokoja and also threatening to kill himself and intentionally implicating the police officer over his death. 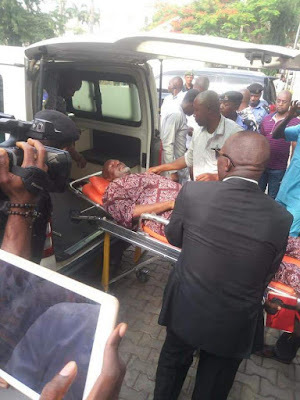 The court ordered also Senator Melaye to deposit his international passport with the FCT Commissioner of Police and that he shall also report himself at Wuse Zone 2 police station every first working day of the week.